I am trying to figure out how to install crown moulding in a kitchen where the corner cabinet is taller than the cabinet next to it. My Father in law said that if we put it up we wouldn't be able to open the door that is on the corner cabinet without hitting it on the crown moulding on the cabinet next to it. Any suggestions? There must be a way. I have seen it done in magazines, just not sure how to get to the finished product. Hey Amber, adding a spacer behind the wall cabinet is a great idea and would work to achieve clearance for your crown molding, however every cabinet in each run would have to be moved down by the depth of the spacer which may create a visual problem with lining up with the base cabinets (beyond making a bunch of work). Without moving all of the cabinets you are stuck with using a crown that is pretty straight. Another option might be using a piece of decorative molding (beadboard scroll dentil ect.) to bring the height of the wall cabinets up to the same height as the corner cabinet, then the crown could be consistent throughout. I know this isn't the look you are going for, but it is an option. I hope this helped Amber, let me know if there is anything else I can do to help! Crown moulding always seems to be the DIY project trouble maker. Are you installing the moulding on the tops of the cabinets or on the wall and ceiling? Or are you installing it from the ceiling to the top front of the cabinet. I am having a hard time picturing the issue. Do you have a picture of what your cabinets look like or what you want the finished product to look like? Thanks for the help. The moulding will go on top of the cabinets. I hope these pics help. One is showing the door open which is my concern. I don't want the glass to hit the moulding. My father in law actually said that if we put it up you couldn't even open the door much. Hey there r5bucks I'm afraid that your father in law is correct, typically when wall cabinets are installed with the intent of using a crown molding, the corner cabinet (taller) would be deeper than the other wall cabinets by at least the depth of your intended molding. You could put up crown molding only on the corner cabinets and use a small detail molding like a dentil on the wall cabinets. 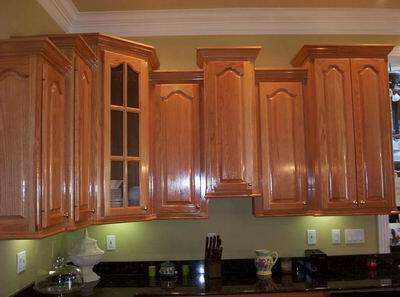 This picture does a good job of illustrating the depth difference needed for crown molding when cabinet height varies . I hope this helps r5bucks. Shoot! That's what I noticed when looking closer at pictures today. Do you think we could block out (maybe put a 2x4 behind and remount) that cabinet (corner) to still use the moulding and not have it look weird? I don't think you would be able to tell at all. The only thing I see that would be affected would be an apploance garage underneath ( not shown ) but we could remove that and I would be fine with it. Thanks so much Blake. Thanks so much for your help, Blake. I can't help but be disappointed though. We bought the crown at the same time as the cabinets with the designer. She should have known how to accomplish this. Unfortunately this is just another mistake to add to the many she made on our kitchen. Now I have a few hundred dollars of moulding that I can't use and I have to go for a different look altogether. Sorry, I just got excited about finally finishing this. Hey r5bucks, I brainstormed with the kitchen designers in my store over the weekend. The best solution we came up with was to unfasten the corner cabinet and drop it down so that it meets up flush along the top, this would be dependant on there being enough counter clearance for you to do so, you could perhaps find a different appliance caddy to fill in the space or maybe order another corner cabinet that would meet up flush on the top and bottom (I'm not sure if other cabinets in the kitchen are also castled). 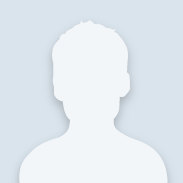 I'm not sure if you are still monitoring this thread, but if you have any more questions you know where to find me!